SUBHEAD: The tragedy of 3/11/11 and the horrors of Fukushima Daiichi has unhinged the Japanese mind. 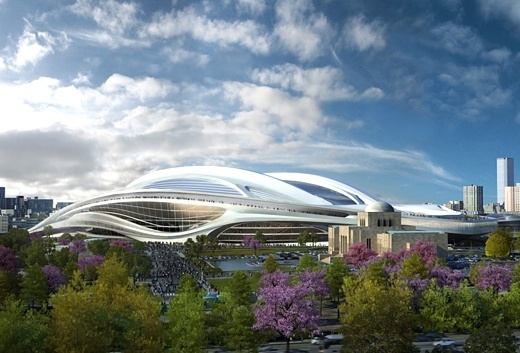 Image above: Zaha Hadid Architects' proposal for Japan's new national stadium to be built for the 2020 Tokyo Olympics. From (http://damoncoulter.photoshelter.com/image/I0000qQkANyZU7NU). It has been my opinion that the terrorist attacks on America on 9/11/01 that destroyed the World Trade Center in New York and seriously damaged the Pentagon drove the United Stated to madness. The ramifications are still roiling through our bloodstream - an endless war against the Middle East and Fascist security measures at home that include spying on every communication Americans make and a militarization of our police and transportation systems. Well we are not alone. The tragic events in Japan two-and-one-half years ago have driven Japan into a madness that leads straight to Fascism. Officials will often argue that they are only trying to keep the public calm and avoid panic, but it is more likely officials want to protect themselves (or their handlers) by "saving face". In Asia the cultural attribute of "saving face" still has a powerful hold. Japan is no exception. With regards to the government and industry handling of the Fukushima Daiichi disaster this is proving to compound the problems. PNAS scientific journal published by Japanese scholars, Oct. 5, 2011: about 20 percent of Japanese land, including Tokyo, is contaminated with highly toxic radiation. It is obvious that agricultural products are also contaminated as the land is polluted with radioactive materials. The contamination on land will last approximately 300 years. The Japanese government effort made to presented Tokyo as the best venue in the world to host the 2020 Olympics is one sign of the self-delusion of the country. There is little doubt now that Japan will never return to business as usual. Fuskushima Daiichi is a festering wound that cannot be "healed". It is merely a question of how bad will it be... and that won't be known even by our great-grand-children. Japan is not alone in its madness. The US government is in denial and obscuring the risks to health of the Pacific Ocean and the West Coast. So is Canada. Even the United Nations' International Atomic Energy Agency (IAEA) cannot be trusted. According to itself, the IAEA "serves as the world's central intergovernmental forum for scientific and technical co-operation in the nuclear field." As a referee to protect the public and the environment one has to wonder when it has spent over half a century encouraging the development of the peaceful applications of nuclear technology. If you want to know how intense the madness can be in Japan see The Cove. It was the winner of the Audience Award for Best Documentary at the 2009 Sundance Film Festival, The Cove follows a high-tech dive team on a mission to discover the truth about the dolphin trade as practiced in Taiji, Japan. This movie uncovers how this small seaside village serves as a horrifying microcosm of massive ecological crimes happening worldwide. Video above: Trailer for "The Cove", 2009. Horrific secret slaughter of dolphins uncovered in Japan. From (http://youtu.be/4KRD8e20fBo). Japan government engaged in a vast, duplicitous and fruitless campaign to decontaminate Fukushima Prefecture..